Jigger, Muddler, Shaker Classic/Boston, Strainer, Flûte. 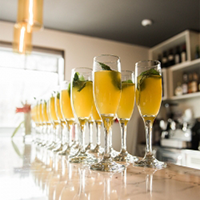 In a champagne flute, gently muddle 2 mint leaves with the mango nectar. Fill with ice and add rum. Top with prosecco. Garnish with the remaining mint leaf and add a pretty paper straw for a fun finishing touch.